rails.EN 60 715 TH35, TH15 and G32 DIN rails. Enclosures inside: 70 x 105 x 60 mm. Universal mounting in all three commercially available rails. EN 60 715 TH35, TH15 and G32 DIN rails. terminal required 00 - No Term to 36 Max Term. 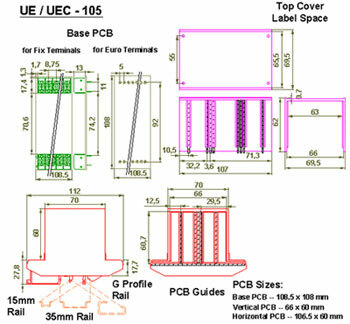 UE-105 Enclosure with Fixed 24 Term. UBRH High Bracket for Wall / Surface mounting. UBRL Low Bracket for Wall / Surface mounting.